The phrase “green technology” generally refers to the application of advanced systems and services to a wide variety of industry sectors in order to improve sustainability and efficiency. These improvements could include: reduction of waste, spoilage and shrinkage; improvement of energy efficiency and energy conservation; creation of systems that are energy self-sustaining; the reduction of carbon emissions; a reduction in toxic waste and the emission of toxic gasses such as volatile organic compounds (VOCs); creation of products that are biodegradable; enhancement of water conservation and water quality; and promotion of the reuse and recycling of materials of all types. Determining the size of the green technology market is difficult at best. A large number of companies, in a very wide variety of industries, deliver green tech products or services as at least a part of their total offerings, but the actual revenues are difficult to ascertain. Many small and startup companies are involved as well. Considered in the broadest possible terms for green tech activities, products and services of all types, Plunkett Research estimates the global green tech at approximately $4.67 trillion for 2018. The energy sector, in all of its many facets, is unquestionably a major part of the green tech field. For our brief video introduction to the Green Technology industry, see www.plunkettresearch.com/video/greentech . The phrase “green technology” generally refers to the application of advanced systems and services to a wide variety of industry sectors in order to improve sustainability and efficiency. These improvements could include: reduction of waste, spoilage and shrinkage; improvement of energy efficiency and energy conservation; creation of systems that are energy self-sustaining; the reduction of carbon emissions; a reduction in toxic waste and the emission of toxic gasses such as volatile organic compounds (VOCs); creation of products that are biodegradable; enhancement of water conservation and water quality; and promotion of the reuse and recycling of materials of all types. 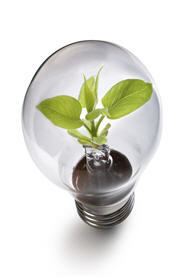 Determining the size of the green technology market is difficult at best. A large number of companies, in a very wide variety of industries, deliver green tech products or services as at least a part of their total offerings, but the actual revenues are difficult to ascertain. Many small and startup companies are involved as well. Considered in the broadest possible terms for green tech activities, products and services of all types, Plunkett Research estimates the global green tech at approximately $4.67 trillion for 2018. The energy sector, in all of its many facets, is unquestionably a major part of the green tech field. Bloomberg New Energy Finance (BNEF) counted, as of 2015, more than 600 publicly-held companies worldwide in the clean energy value chain, with at least moderate corporate exposure to renewable energy or smart technologies. For 2018, the firm estimated global investment in clean energy at $332.1 billion, up from $328.9 billion in 2015. The application of green technologies, systems and practices need not be especially high tech in nature. Everyday product packaging is a good example. Better design and engineering are creating packaging that is lighter in weight, more recyclable and less reliant on petrochemicals. This improved engineering is also leading both to products and their related packaging that have a smaller footprint—thus more units can be shipped in one shipping container, cutting down on the total amount of energy used in transporting a large volume of merchandise. The global consumer class (the “middle class” segment of the population—those with at least enough income to make a modest amount of discretionary purchases) is booming. The middle class grew from about 1.1 billion in 1980 to more than 3 billion today, and is expected by to soar to 5 billion as soon as 2030. This rapid expansion will put tremendous pressure on resources of all types, including energy, water, food, construction materials and industrial materials. Moreover, this soaring demand will put powerful upward pressure on prices, which, in turn, will make the cost of greener conservation and efficiency technologies increasingly easy to justify. Green technology affects these sectors in a wide variety of ways. For example, the broad field of energy continues to produce transportation fuel and electricity in a largely traditional manner (from natural gas, coal and petroleum). At the same time, however, a very significant effort within the energy sector is focused on conservation and efficiency as well as the development of renewable energy sources. In fact, throughout the green technology field, conservation is where the low-hanging fruit lies. The easiest green solutions will be in better insulation in buildings; lighter materials in cars, trucks and airplanes; reduction of today’s massive leaks in municipal water systems; and better storage, in the emerging world, of agricultural products in order to reduce spoilage. Simply making efficiency, in materials and energy usage, a consideration in engineering and design of all types, is already having a dramatic effect on sustainability. For example, Wal-Mart, the world’s largest retailer by far, set a goal for its suppliers to reduce packaging on average by 5% over a recent five-year period. At first glance, this may not sound like much, but the fact is that the amount of packaged products that flow through Wal-Mart in a given year, with hundreds of billions of dollars in annual revenues, is so massive that 5% adds up to a tremendous amount. As part of this process, the company has created a sustainable packaging scorecard for more than 600,000 items that are sold in its stores and Sam’s Clubs. The scorecard evaluates the environmental attributes of packaging, and enables its suppliers to measure whether or not their packaging reduces energy consumption, cuts waste and fosters sustainability. The company even has an annual “Sustainable Packaging Expo” where its suppliers can meet with leading packaging manufacturers and designers to learn about the latest technologies and innovations. With thousands of long-haul trucks in the U.S., Wal-Mart had a goal of doubling fleet efficiency from 2005 levels by the end of 2015. Long term, Wal-Mart has set a goal of being packaging-neutral by 2025 in the U.S., Canada, U.K. and Japan. That is, the company plans to be recycling packaging and waste to the extent that it uses no more packaging materials than it creates. The firm is already more than 80% effective in this regard. During 2017, it reduced total annual waste generated by global operations by 1% compared to 2016. During 2017, the company diverted 78% of unsold products and packaging from landfills globally and 81% in the U.S., through recycling and other initiatives. Wal-Mart, the world's largest retailer, has set dramatic goals for the application of the latest green technologies in packaging, energy and other areas. To see the results, go to: http://corporate.walmart.com/global-responsibility/environmental-sustainability . Future answers to green challenges will be found in areas as diverse as highly efficient automobiles that virtually drive themselves, lighter aircraft bodies and changes in building materials. Convergence of multiple technologies (including nanotechnology, biotechnology, and information technologies, such as artificial intelligence and predictive analytics), along with the continuing advance of miniaturization, will guide these efforts. The electric utilities industry has told us for decades that it is a lot easier and cheaper to conserve electricity through the use of efficient industrial systems, buildings and appliances than it is to build more capacity to generate additional power. However, conservation is not an immediate fix; instead, it is a long-term evolution. For example, a few decades ago, one of the major expenders of energy in a typical American home was the gas pilot light, burning 24/7 on furnaces, cooking stoves and water heaters. Today’s appliances don’t have pilot lights; they have on-demand electric igniters, so that no gas is burned while the appliance is idle. Likewise, today’s refrigerators use about 75% less electricity than the refrigerators of 1975, while holding 20% more capacity, because they feature better insulation and more efficient cooling systems. Otis, a world leader in elevator design and manufacturing, recently introduced its Gen2 elevator, which uses up to 75% less electricity than previous models. These are good examples of well-engineered, extremely cost-effective reductions in energy usage, but such changes take time. We didn’t see old-technology refrigerators tossed out of all homes in America at once. The International Energy Agency (IEA) estimated that for 2017 alone, companies and government agencies in large nations invested $236 billion in energy efficiency. Energy conserved through the application of advanced appliances, technologies and methods may be referred to as “avoided energy.” A continuing result of widespread interest in reducing energy usage has been impressive growth in revenues at companies that provide goods and services that boost energy conservation. Ever since the dawn of the Industrial Revolution, factories have been burning such fuels as coal and natural gas to make steam, flame their furnaces and turn their engines, but historically they let the resulting excess heat escape through stacks. Now, with the concept of co-generation (or CHP, “combined heat and power”), this is less and less likely to be the case. In manufacturing plants, co-generation is being widely applied as a simple, relatively low tech method to capture and reuse factory heat that is generated by industrial processes. That salvaged heat may be used in any of several ways to power a turbine that creates electricity. The electricity can then be used by the factory, sold to the grid, or both. Oil and gas fields are becoming much more efficient. For decades, oil fields flared off excess gas in brilliant, multi-story towers of flame, even in Alaska, relatively close to the lower 48 states’ gas-hungry consumers. Today, except in the remotest fields, that is less likely to happen, as investments have been made in gathering systems and pipelines to bring the gas to market. Meanwhile, advanced technologies and practices are enabling older fields to be productive for much longer periods of time, greatly increasing the total amount of oil and gas that each well will produce over a lifetime. Nanotechnology, an advanced materials science, is one of the most exciting technical breakthroughs in the world today. Throughout the energy arena, the list of potential applications for nanotechnology to enhance production, energy storage and conservation of all types continues to grow. For example, a lot of time and money is being invested in research using nanotube technology to create highly efficient electricity storage devices—essentially giant batteries. Success could bring a significant breakthrough for the solar and wind energy industries, where storage solutions are vital to making alternative power generation more viable. Cost-effective ways to store electricity would mean that wind power could be captured when the wind is blowing and utilized later, and solar power could likewise be banked. Tremendous strides in green technology are also being made throughout the transportation services and transport equipment industries. Developments in transportation include the use of natural gas to fuel public transportation and the development of energy-efficient light rail.